You're kind of stuck. 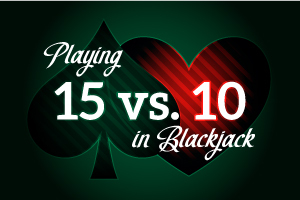 You have a 15, which is a very weak hand, and the dealer looks like he's going to be "pat" with a 10 as his upcard. Here, it doesn't matter whether you're playing with one, two, four, six or eight decks. And the rules variations at your disposal, for purposes of this situation, are moot except for the fact that they do not include the surrender option. This is a tough predicament, but you've got to do SOMETHING. What's it gonna be? Well, this is another one of those hands where you can't win for losing. The good news, for those of you who would never hit this hand, is that you'll win about 23% of the time, as opposed to a 22% win rate if you hit. The bad news, the horrible news, in fact, is that if you insist on standing with the 15 against the dealer's ten, you will lose 77% of your hands. By hitting you'll lose less than 72% of the time, and push on about 6% of the hands. So, as it is in many cases we'll encounter, the push is your friend here. It's essentially what makes hitting a much better play then standing. Hitting stiff hands against advantageous dealer upcards is almost always going to be a better play than not hitting. Remember, the game of blackjack does not accommodate so-called "instinctive" playing decisions in the way poker does. Here, our plays are based on what the hard percentages tell us to do. So "bite the bullet" and hit. That's the way you have to go! !